The only aluminum screen developed specifically to protect against tiny insects, this tightly -woven metal wire mesh also provides excellent visibility and air flow. 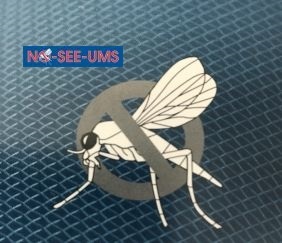 Perfect for windows, doors or screened porch areas where gnats, black flies or no-see-ums are a problem. This product offers better tensile strength over traditional no-see-um fiberglass screen, while maintaining outstanding visibility and curb appeal. Core Wire Diameter .008 Widths 36", 48", 60" & 72"
The absolute best combination of High Visibility, Superior Insect Protection and more durable than fiberglass. Ideal for use in patios, porches, windows and doors.